If you are visiting this site then congratulations are in order! You have made the excellent decision to make music a part of your life! You've come to the right place. The talented and experienced instructors at King Music Center teach all ages, all skill levels and most instruments. This includes guitar, drums, mandolin, banjo, fiddle, bass, dobro, band instruments such as saxophone and clarinet, singing, sight reading and more. Our goal is to give you the tools to progress and become a well-rounded, self-sufficient musician. Text or call 336-528-1507 to sign up. Our phone number has recently changed. Please text or call 336-528-1507 with questions or to make an appointment for your first lesson. Feel free to email ralphmcgee98@gmail.com. Hours are by appointment. Our teachers are typically available Monday through Friday from 9 am to 9pm, and Saturday 9am to 12. We have moved to 619 B East King Street, King, NC. This is different from what Google or GPS may tell you. Thank you for your interest! We look forward to doing business with you. K.M.C. 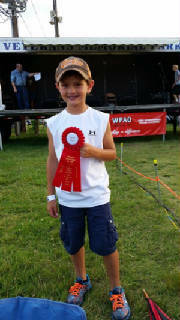 Student Brody York takes home a ribbon from the Mt. Airy Fiddlers convention youth competion.